Review: This tasty, DJ-friendly 7" single boasts two extended, break-heavy reworks of obscure and in-demand soul workouts. 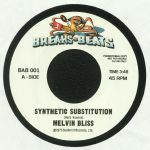 On the A-side you'll find a tasty extension of Melvin Bliss's superb, piano-heavy 1983 cut "Synthetic Substitution". While Bliss's brilliant original - all heartfelt vocals, jaunty keys and warm bass - is largely kept in tact, the mystery re-editor naturally makes more of the opening breakbeat, which was sampled several times during hip-hop's "golden era". Flip for a similarly tasty rearrangement of Sweet Daddy Floyd's 1978 Blaxploitation style disco-funk shuffler "I Just Can't Help Myself", a cut rich in rolling breaks, densely layered percussion, punchy orchestration and "Shaft"-style guitar licks. 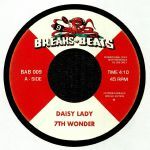 Review: The latest limited 7" single from the Beats & Breaks camp features subtle, DJ-friendly edits of two break-diggin' favourites. On the A-side, Juice's 1976 jazz-funk B-side "Catch a Groove" gets tweaked and extended, with lengthier passages of drum breaks at the beginning and end, as well as a sizeable percussion workout midway through. Turn to the flip for a similarly minded treat of Fuzzy Haskins' album-only cut "The Fuz & The Dog", where jazzy guitar licks and riotous horns buzz around a heavy, Blaxploitation-inspired funk groove. 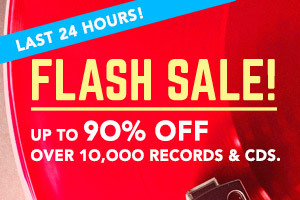 While less well known than the A-side, it's arguably the stronger of the two tracks; certainly, its extended percussive break is particularly suitable for hip-hop style doubling up. Review: More from the matter-or-fact Breaks & Beats seven-inch series, which offers up DJ-friendly "slight edits" of funk, soul and disco classics built around extending the drum breaks in sometimes hard-to-mix classic cuts. The tenth volume in the series kicks off with a mix-friendly tweak of Vaughan Mason's roller-boogie anthem "Bounce, Rock, Skate, Roll" that expertly stretches out the previously all-too-short instrumental intro. Over on side B, Bad Bascomb's odd but brilliant country-funk hoedown "Black Grass" gets a similar treatment, with Breaks & Beats' un-named re-editor sneakily extending sweaty drum breaks here and there throughout the track. Given the quality of those breaks, this is a very good thing indeed. 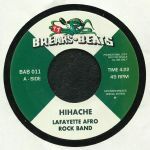 Played by: Mukatsuku Records Chart, JimmyTheTwin, SOOPASOUL, Juno Recommends Funk, Osmose, I Love 45's! Review: Beats & Breaks are slowly working their way through some of the most seminal and scene defining foundational funk cuts. For the 007 release we're treated to a wild jazz excursion as Pleasure and Rusty Bryant get the treatment. "Joyous" (famously edited by DJ Harvey) get its swing polished and really brought to the fore on those shiny rhythm guitar builds while Rusty's king break-buster "Fire Eater" gets extended in all its sleazy Q&A glory. Limited to 300. Them's the breaks! 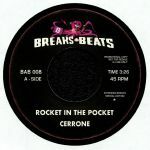 Review: The Beats & Breaks 7" series was founded to satisfy the desires of DJs, mainly by serving up re-edits that put some of the world's most recognizable drum breaks front and centre. 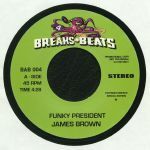 This edition kicks off with a rearrangement of the Winstons' "Amen Brother", whose drum break not only became a staple of U.S hip-hop in the 1980s, but also the foundation of jungle and later drum and bass. This edit wisely gives plenty of air time to the infamous drum break, dropping into it at frequent intervals in between bouts of punchy, horn-heavy funk. Flip to the B-side for a tastefully chopped and rearranged version of The Chosen Few's super-sweet 1976 soul cut "Candy I'm So Doggone Mixed Up".